Netflix has had a rocky track record with the success of its original films with works like “Bird Box” and “Bright” falling short of expectations. This in addition to the intense doubt surrounding the possibility that any of their original content will ever be nominated for an award because of their “made for TV” status, has meant that netflix’s chances of nabbing an award were slim. Then, at last, Netflix pinned down a fantastic directing pair, the Coen brothers (Joel & Ethan Coen), to provide a new concept that was might change the perception of netflix’s original films. “The Ballad of Buster Scruggs” is the western love child that was born out of this situation. It’s a film that challenges viewers preconceived notions about what westerns should be, while still being loyal to the format that it’s creators were inspired by. It’s certainly a new face for Netflix, but is it award worthy? “The Ballad of Buster Scruggs” is composed of six vinyets, set during western expansion after the Civil War. 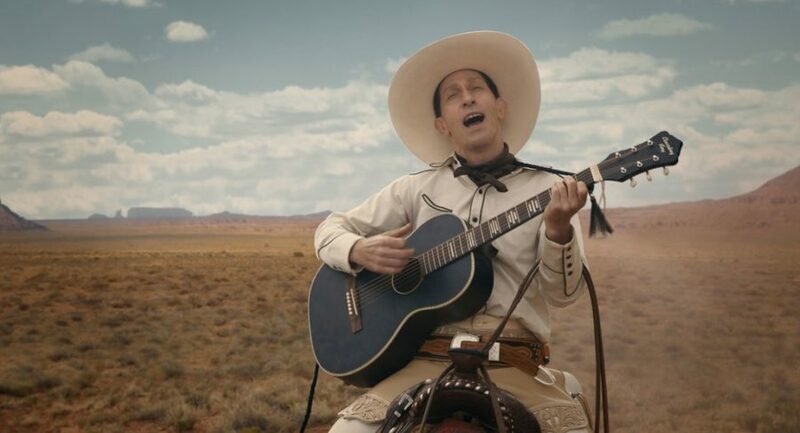 The first vignette, called “The Ballad of Buster Scruggs”, stars a white clad title character (Tim Blake Nelson) who travels the west singing songs and performing general deeds of badassery. The second vignette, tited “Near Alondages”, is about a lone cowboy (James Franco) who attempts to rob a bank (with a hilarious cameo here), gets caught and is about to be hanged, but is saved by a passing cattle rustler. Unfortunately he is once again caught and is ultimately killed. The third story, titled “Meal Ticket”, is about an old struggling manager (Liam Neeson) and his innocent quad-amputee performer (Harry Melling). It chronicles their struggle to survive while providing rare moments of beauty and how in the end, survival is more important. The fourth vinyet is called “All Gold Canyon”, about a lone prospector (Tom Waits) who is on a mission to find gold in a beautiful forest canyon. He finds the vein, is claim-jumped, escapes death, and rides of into the sunset. The fifth vinyet, “The Girl Who Got Rattled”, follows a young woman, Alice Longabaugh (Zoe Kazan) trying to survive by herself on a long Oregon wagon train ride. Alice succumbs to her fears in a tense moment and it is her end. The sixth and final vignette is titled: “The Mortal Remains”, about five travelers in a darkening coach, driven by a mysterious driver who will not stop. They talk about their travels, but are oddly unaware of why they are together. The passengers on the left of the carriage (Tyne Daly,Saul Rubinek,Chelcie Ross) become more and more suspicious of the two undertakers on the right of the carriage. When they reach their gloomy destination they enter with cautious, bewildered expressions and credits roll as western music plays. With over 20 films under their belt, the Coen Brothers are seasoned directors. With every film they make they add to the perverse drama and humor that subverts your every expectation. Their choice in this film to favor aesthetic beauty over spectacle is in the style of their other films like “The Big Lebowski” or “Oh brother, Where Art Thou”. “The Ballad of Buster Scruggs” is the perfect format for their style because of how well known the western genre is. The first films that often come to mind when you mention westerns are classics like “The Magnificent Seven” or “The Good, The Bad, and The Ugly”. However, The Coen brothers introduce hilarious comedy that will make you laugh out loud when something happens as you least expect it. They can also pull on your heart strings with an unexpected death that shocks, or a twist ending makes you question the whole set up and it’s complex themes. The mark of a great director is the ability to use tone in different and purposeful ways, and the Coen brothers have obviously nailed that in this film. The central idea behind “The Ballad of Buster Scruggs” is the concept of death as a constant element in western expansion, and life. A book of western tales any kid might read is introduced at the start and provides the structure for the stories. The Coen brothers are auteurs in every step of their creation process, borrowing from previously written material as well as their own stories. The characters are so well fleshed out that the sketches, while short, don’t feel incomplete. The writing can swerve from silly to severe in a deft manner that doesn’t feel out of place in the rest of the film. Other modern westerns tend to focus on the politics and ethics of expansion, but the film is something totally new in it’s writing style. The conversations between characters are expertly tailored to fit the relationships and the surprises don’t feel weird. Every performance in “The Ballad of Buster Scruggs” is terrific. With high caliber talent like Liam Neeson and Tom Waits, there is a lot to expect from the acting. I thought that Tim Blake Nelson’s performance as Buster Scruggs was hilarious. The swagger and charisma of a banty rooster that he brought to the character made him a highlight of the whole film. Liam Neeson and Harry Melling allow you to empathize with a showman so desperate to eat that he would murder his partner using only a few lines the entire story. James Franco’s carefree attitude through everything (even his impending death) is funny and even more surprising when he is recaptured and put to death. Tom Waits was charming as the old prospector in “All Gold Canyon”, and the trio of contrasting strangers in “The Mortal Remains” pull out the everyday faults we all have. It makes it hard to pick out a single performance that could be nominated for best actress or best actor. The cinematography and the score are also top notch. The film is so fully realized that it makes it difficult to sift through for individual award nominations. But there are several awards that it could be nominated for: “Best Directing”, “Best Original Screenplay”, and “Best FIlm”. But what really makes this film such a masterpiece is the obvious impact that the Coen brothers had on every aspect of the film. They are artists that make sure that their concepts and visions are fully realized in all details of the production. It is the kind of film Netflix has needed for a long time that legitimizes their original films. It is an award worthy film in general, and able to go up against big screen works. I wish it the best of luck in the highly competitive 2019 awards season.